I've Got A Domain Name, Now What? 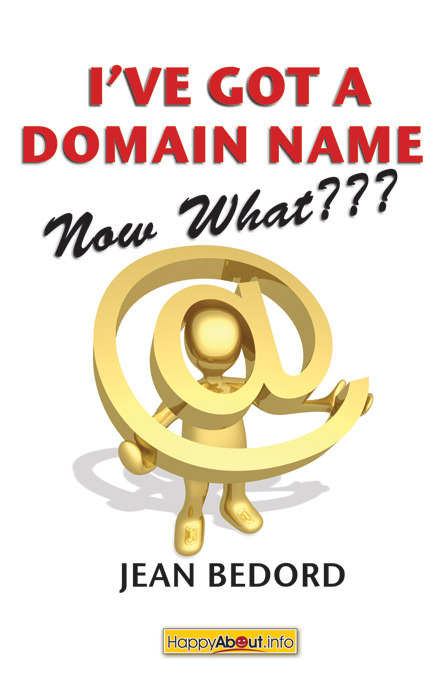 Jean Bedord, author of “I’ve Got a Domain: Name Now What,” recently sent me her book to review. As she explained in her letter to me, “This is targeted to newbies, not the domain industry.” But as she also points out, the book is a great resource if you deal with clients that don’t understand domain names. It walks through the process of acquiring a new domain name and explains the terms and processes used in ultimately preparing a website, all in simple and easy terms that even your least technical client. As a domainer or web professional, you might find little value in this book. Then again, it may provide you with the non technical perspective you need to speak to your clients and bridge the gap between your advanced understanding and their confusion. If you’re a web designer, it would be a nice gift to give to each of your clients as you begin the journey of developing a site. Again, this is nothing ground breaking for most of the readers of this site, but it can be a tool to help you gain the trust of others by helping them get a better understanding of how things work. I subscribed. So should you. I love this blog. You really stand out from the crowd with informative and interesting fresh stuff. And provocative interviews too. Congratulations. Thanks Owen. I consider that a huge complement, I appreciate it.